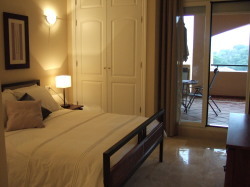 Fabulous apartment in an exclusive spanish style complex nestling in the beautiful residential area of Elviria. This 2 bedroom apartment is set in tropical landscaped gardens with several swimming pools to the front and rear of the apartment. Santa Maria Village is a few minutes drive from the best beautiful sandy beaches on the Costa Del Sol. Fine wine and excellent restaurants of Marbella and Puerto Banus are within a short drive as well as being close to some of Andulucias finest shopping areas. The apartment has a large shaded terrace area, ideal for relaxing and watching the sun go down. The property is ideally located for exploring the coastal regions or the countryside of Andalucia. This is the perfect location for families, couples or golfers. 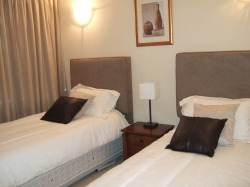 ACTIVITIES NEARBY:- Elviria is perfectly located for the wonderful golden sandy beaches of Costa Del Sol. Swimming, snorkelling, fishing, sailing or admiring the sights in Puerto Banus are favourite actvities in this region. A trip to Tarifa is worthwhile for the more adventurous or those just curious to witness one of the worlds top spots for kite surfers. Marbella Old Town and Orange Square are great places to visit and experiencing fine food or just chilling out watching the world go by. Shopping in this region is excellent in the fine boutiques and designer shops of Marbella and Puerto Banus. The area is ideal for those wishing to explore Andalucia and further afield with Gibraltar, Seville, Cordoba, Rhonda, Granada and the Sierra Nevada ski fields all within a couple of hours drive. Within 20 minutes drive you will find many of the famous Andalucian white villages of Ojen, Casares and Gauchin. Sampling local cuisine from one of the many mountain restaurants and downing a bottle of the finest Spanish wines looking down from the Andalucian mountains towards theis famous coastline is a fabulous experience. One not to be missed. This is a golfers heaven! Within 2 minutes drive is Santa Maria golf and country club. Santa Maria is one of 20 or more top quality golf courses in the Marbella region which attract golfers worldwide. There are also water parks and theme parks close by for all the family. This is simply a top quality complex in one of the worlds premier holiday destinations.